I have been wanting to try Japanese Buffet for very long. After doing my research, most people seemed to agree that Ikoi Japanese Restaurant at Hotel Miramar, Irodori Japanese restaurant at River View Hotel and Senki Japanese Restaurant at Killiney road are amongst the best Japanese Buffets in Singapore. As my friends have been to Ikoi and Irodori Japanese restaurant before, we ended up at Senki Japanese Restaurant for the buffet dinner. With over 100 items on the Japanese buffet menu, it’s probably a good idea to skip lunch if you are going there for dinner. Most importantly, come with a group of friends so that you can order more things to share. Under normal circumstances, it is a sin to order so much food. But since we were already at Senki restaurant for their Japanese buffet, we would be fools if we didn’t eat to our hearts’ content. I could imagine the number of rounds that I have to run the next day just to burn off the calories — oh whatever, the diet can wait. Amongst the Sushi/maki available on Senki’s menu, we tried the Floss Karashi and Mango California. The former was surpsingly good, the tasty chicken floss had a slightly spicy sauce. While the latter was not too bad, it came with the appetising mango topping on top of the typical California maki. We were proceeding on a rather slow pace. Mindful of the fact that there were many items that we wanted to try, we only had a hand roll each. 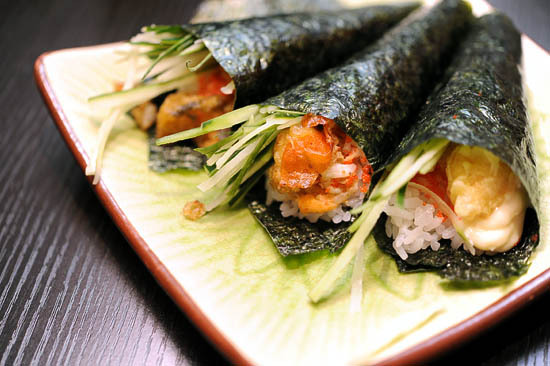 Senki Japanese Restaurant has quite a selection of different hand rolls: California, ebi tempura, salmon skin, chopped tuna, tamago, tuna, salmon. My friends’ eyes were glittering when the Sashimi platter arrived. This is probably the highlight of the Japanese buffet since you can eat as much sashimi as you want. Tuna, sword fish, salmon, yellow tail sashimi were devoured in an instant. We kept asking for salmon sashimi throughout the night – free flow sashimi is joy. From the appetisers, we had chawanmushi, and goma tofu. We continued to fill our stomachs with the grilled dishes: sticks of Yakitori which were so-so, the seemingly healthy grilled shiitake, the Saba Shioyaki, and the delicious Jagaimo Mentai cheese yaki (potato with fish roe and cheese). Deep-fried food always tastes good. Needless to say, we had an assortment of tempura (prawn and vegetables). Another favourite was the Agedashi Tofu, fried beancurd that was crispy outside and soft inside. 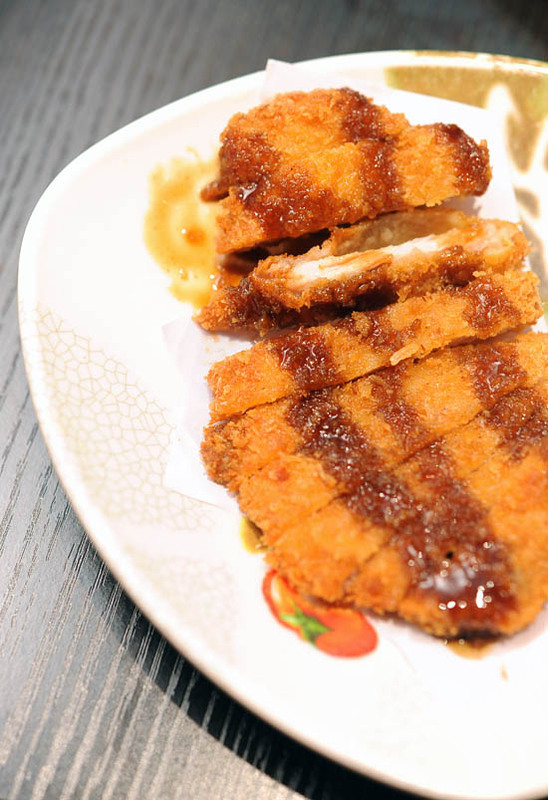 Forget about Senki Restaurant’s tonkatsu, it is not worth the calories. 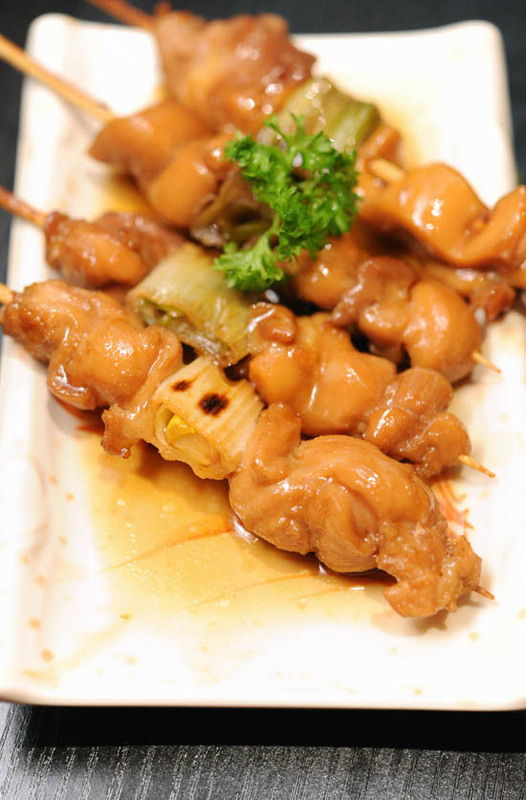 If you like deep-fried food, go for the Tori Karaage – juicy chunks of fried chicken that were good and sinful. I cannot remember how many items we tried out of the 138 selection on Senki’s Buffet menu, but we definitely ordered at least a few dishes from each category. For those of you who are keen on the Japanese buffet, the different selections include: appetiser, salad, sashimi, maki, nigiri sushi, hand roll, Itamemono (pan fried dishes), Owan Mono (soup), Agemono (deep fried dishes), Yakimono (grilled dishes), Menrui (noodle), and Gohan (rice). Between bites, we stoned for a few moments, and stared at the empty plates on the table. We ate, and ate, and ordered some more. We chatted, and took toilet breaks to rest our stomach for even more food. It felt as though we were feasting for three days long. The Japanese Buffet at Senki Japanese Restaurant is $30++ for lunch, and $33++ for dinner. Prices are the same for weekday and weekend. For eve/public holidays, it is $39++ for the buffet dinner. 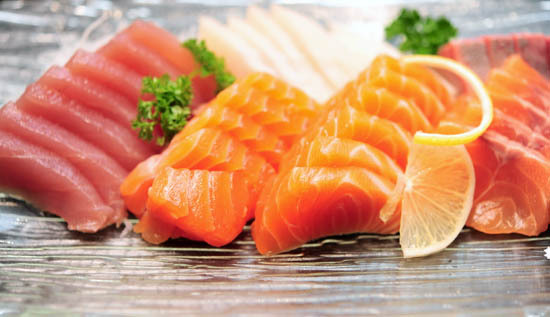 Which is your favourite place for Japanese Buffet in Singapore? The buffet at Hanabi is rather good. Went Senki once and never want to go back there again. 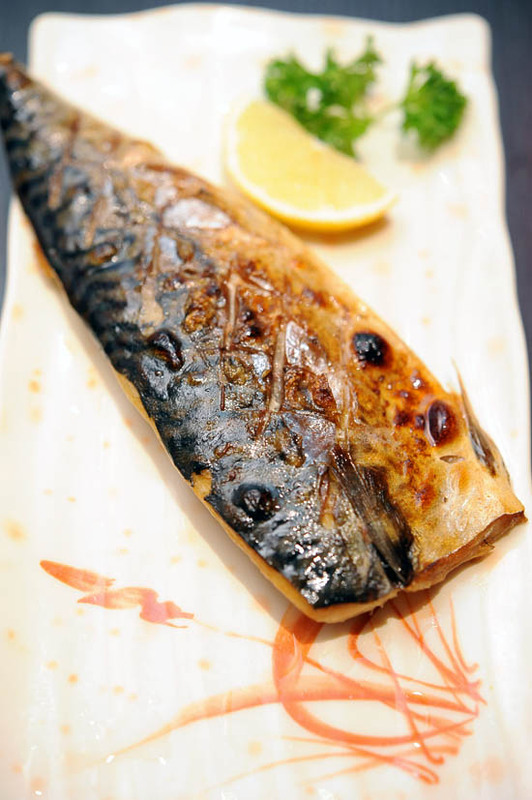 The grilled saba was so dried and the yakitori was tasteless….. Can try Kuishin Bo………. Yes, my favourite is the one at En Jap at Crown Centre too! It not only serves free flow sashimi and other high quality food it also serves wagyu beef shabu shabu All for $48++. How to beat that? Having tried countless Jap buffets in Spore, I can safely say this is the best by far! Beats Ikoi (standard dropped a lot over the years. Used to be my fav), Hanabi, Shin Minori, Himawari (pretty good too), and some others whose names are forgettable (there’s one at IMM, and one at Turf City). Try En Dining!! You won’t regret it. Oh…and great service too! Time to hit those Japanese buffets sometime soon. Thanks for sharing! Has anyone tried Z’en Japanese Cuisine at River Valley Road, UE Square before? Is it good? Food quality in Senki, including Sashimi, is way below expectation!Will never go back there again. i love Z’en, quality is way better..i feel better than ikoi and irodori but its not as ‘main stream’ as what most Singaporeans like. I saw your post and went to have a try at this place. Very disappointed. Don’t think there are as many items as expected. I ran out of orders after 2nd round. Sashimi was also so-so. The swordfish was sliced very thinly, like fishcake. Sake available was really bad. Maybe the standards have dropped from before or maybe it’s just one-off. But I would never go back to give it another chance. Not worth it and it’s way below expectation. went there for lunch last week. the food was above average and the sashimi was good! however, the service is by far, the worst i have ever encountered. the worst food I ever ate in my life. The sashimi is so stale and very fishy smell. Chawamushi is tasteless the grill mushroom have a raw fishy smell and I saw a fish scale on top of it. How could it be the fish scale is on top of the mushroom? After 30mins at the place I make my exit. I couldnt believe how awful it taste like and I wouldnt want get sick after eating a super not fresh food. I thought of giving a try since Ikoi standard dropped but this senki is the worst thing I ever ate. Sashimi was unevenly sliced, tuna has a defrosted texture. Tempura was ok. Nothing fantastic …will not trust recommendation from this blog again. Both food and service are bad ! Never tried before but bought their Groupon voucher for buffet dinner as a birthday gift for my uncle. Comments were both food and service was bad. I must say most comments here are right, the general food and service are pretty bad (well they seemed understaffed). However, for sashimi beyond the usual salmon and tuna selections, it is pretty good ???? This is our 1st visit to Senki Japanese Restaurant. Good recommendation from the review. But total disappointment when we were there. The table was extremely small and we were asked to sit upstairs right at a corner whereby there are still plenty of seats by 7.15pm. The salmon was not fresh compared to other Japanese Restaurant. It is not worth to pay $39+++ with this quality and services. I am pretty sure the standards have fallen drastically since this review was written. My dining experience was the worst Japanese buffet dining experience ever, and the biggest waste of $39++/pax. The sashimi was not fresh, and all the other dishes were not just mediocre, but was really bad. My partner and I barely had anything to eat, and we left to have a proper meal at Marché that was nearby. We’re not people who waste money either but the food was just really really bad. I would never recommend this place. At least not to anyone I genuinely like.